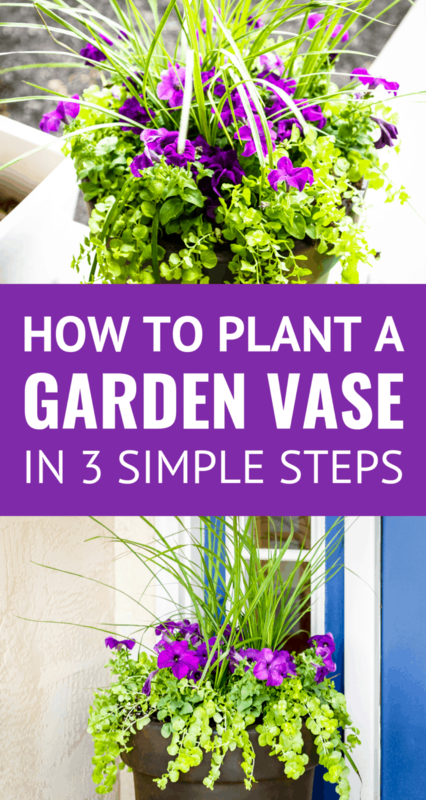 Learn how to plant flowers in a pot in just three simple steps for a perfectly proportioned garden vase that will be a beautiful focal point for your front porch, deck, or patio. Makes planting flowers for beginners EASY! One area I never got around to last summer was sprucing up our front porch. So I was excited when Walmart sent me this great large garden vase as an inspirational starting point. We’ve had somewhat cooler weather the past few days, so I seized the opportunity to plant some flowers before the summer heat really hits. At nearly 21 inches high, this flower planter vase definitely packs some eye-catching drama. And it comes with an impressively low price, far below the prices I saw at our local greenhouse. Plus, this faux ceramic planter has a lightweight resin construction in a durable ceramic finish and is UV resistant, meaning it should last for many years. Only problem? I had NO IDEA what kinds of flower would work best in it. I’m the kind of gardener who just buys whatever flowers and greenery catch my eye without a thought as to where I’m going to plant them, so I was especially smitten when I flipped the price tag to find three suggested steps for creating a perfectly proportioned planting. Having a plan in mind when I was browsing my local garden center was especially helpful! Seriously, this 3-step method is sure to make planting flowers for beginners super straightforward and simple. After the fact, I learned that a lot of gardeners refer to this as the “thrill, fill, and spill” method, and I think you’ll understand why in just a moment… Let’s get started! 1| Choose a dramatic large plant as a focal point. I went with the Dracaena pictured above, because it grows to between 18-24 inches tall. It provides plenty of height in the center of my flower planter already and will continue to grow throughout the summer. 2| Add a soft, billowing filler plant around the base of the focal plant. So around the Dracaena, I added these beautiful deep purple Petunias. Petunias are easy to grow and provide continuous color throughout the summer, ensuring a beautiful flower planter for several months. 3| Plant a trailing or tumbling plant that spills over the edges around the outside. For this effect I went with Lysimachia, a leafy, bright chartreuse plant that provides exactly this effect. It will grow even longer throughout the course of the summer. So do you see the thrill, fill, and spill parallel now? The thrill is the eye-catching, dramatic, tall plant in the center, the fill is a plant that will spread and grow wide, and the spill is a plant that will trail off over the edges of your flower planter. 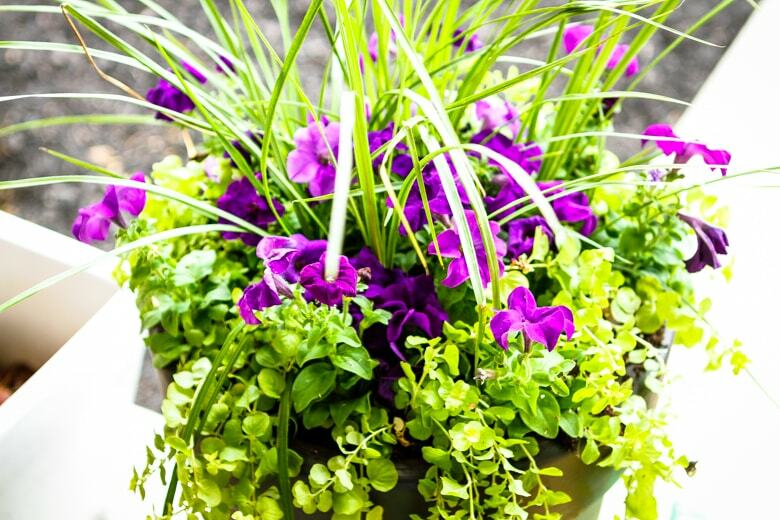 I can think of SO many fabulous flower planter ideas using this easy 3-part combination! PIN IT NOW! CLICK HERE TO ADD THIS HOW TO PLANT FLOWERS IN A POT TUTORIAL TO YOUR GARDENING IDEAS BOARD ON PINTEREST! 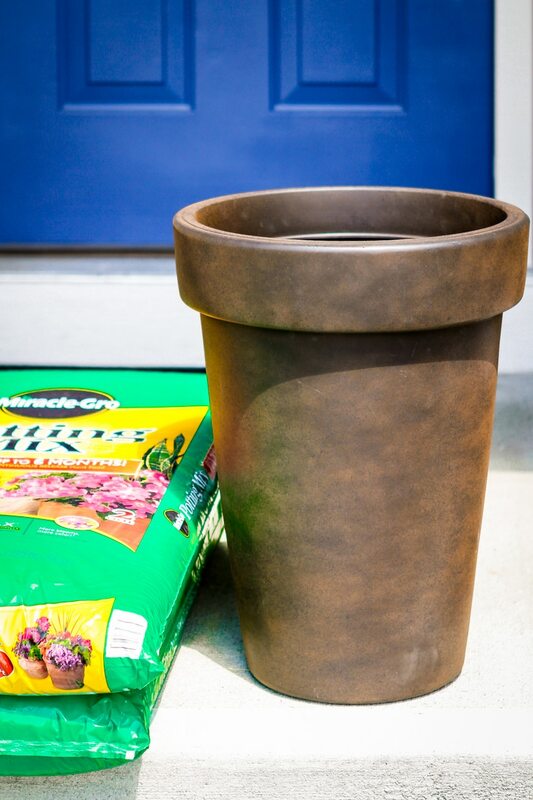 Fill your flower planter up with potting soil. 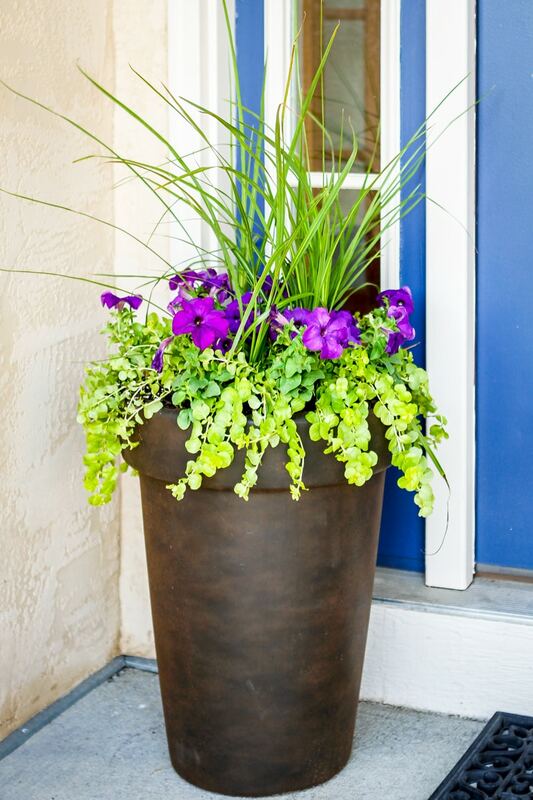 If it's especially tall, like the garden vase pictured, you may want to add some lightweight lava rocks to help fill it out and reduce the amount of potting soil needed. 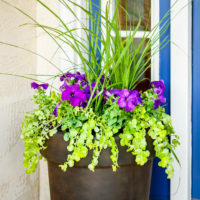 Choose a dramatic large plant as a focal point, and plant it in the center of your planter. 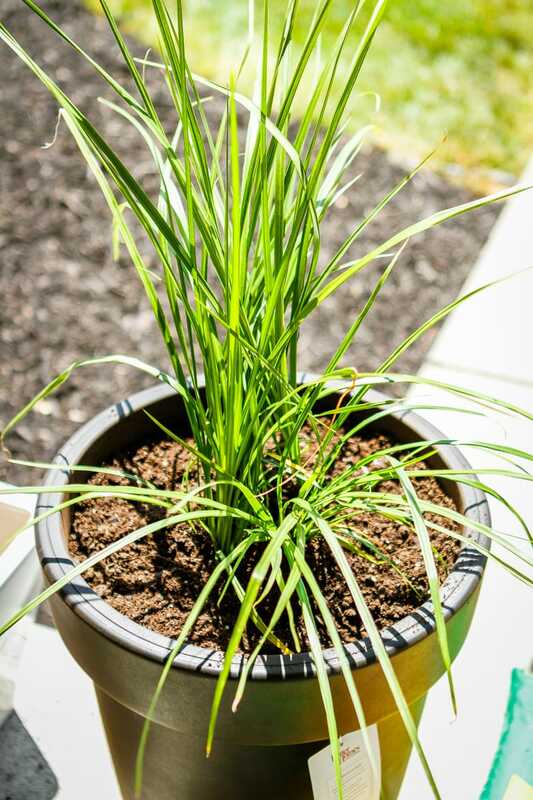 Add a soft, billowing filler plant around the base of the focal plant. Plant a trailing or tumbling plant that spills over the edges around the outside. Water lightly after planting and as needed thereafter. I absolutely adore my flower planter and how it dresses up my front porch! I’m considering adding a few more brighter flowers to it, only because the gorgeous purple shade gets a little lost in the dark navy color that we used on our front door. But I just can’t decide what color I’d like to add. Suggestions please? Indoor Herb Planter — try a different approach with this indoor herb garden planted in a utensil caddy, which can easily be transported outdoors depending on the weather! Growing Strawberries in Pots — yes, you can grow strawberries in a pot! Planting strawberries in pots is an ideal solution for colder climates that have late frost dates. Braided Hibiscus Tree Care — learn how to care for a braided Hibiscus tree year round with these, along with advice for colder climates! I’d love to see how your garden vase turns out… Tag me @Unsophisticook on Instagram or use the hashtag #Unsophisticook so I can check it out. Enjoy! This looks great! I am looking at doing the same thing on my front porch…. however do these flowers need full sun? My porch is covered. No, they shouldn’t need full sun. I had my planter pushed back on the far corner of my porch that doesn’t receive direct sunlight and they flourished. What kind of planting mix did you use??? It was the Miracle-Gro Potting Mix with Fertilizer that’s sold in the Walmart Garden Center. Yellow to contrast the purple and pop against the blue! Bright and cheery colour combination! I agree! Opposite colors will pop!! Also an orange color will be opposite of blue and standout with the blue door…. Thanks for the feedback, Michelle! We recently painted the door black, but I think an orangey red would be perfect. Do we fill the vase with soil, or can we fill it with rocks or something else at the bottom then the soil. Nancy, I filled it with lava rocks at the bottom to help with drainage and also to keep it from getting too heavy. Fill it with pine cones or plastic water bottles to take up room. That way you don’t have to use so much potting soil and it doesn’t get too heavy. Looks beautiful, mine somehow never look this good- thanks for the tips!! I’d say add some hot pink petunias. I heard a gardening “expert” say once that you needed some “upsies” (your focal point plant), some “downsies” (your trailingt/tumbling), and some all “aroundsies” (your filler). I love your planter just the way it is, but if you want to add a little pop, then I also say it has to be yellow!! I love the color just fine. Maybe add some yellow flowers. Oh! How Pretty That Looks!! I Love It!! It looks great. I didn’t know there were “steps” to follow, so this is an excellent article. If you add other color to the vase, add flowers in either a yellow or orange. Both complement purple & blues, & make each other kind of pop. 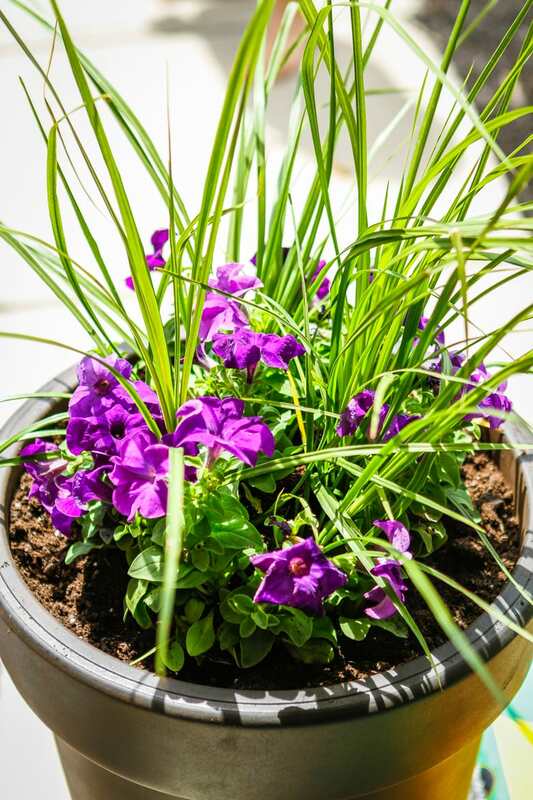 I often look at landscape plantings around large stores or shopping areas–blue and/or purple flowers are always planted with yellow or orange flowers. I think something blue would be lovely.